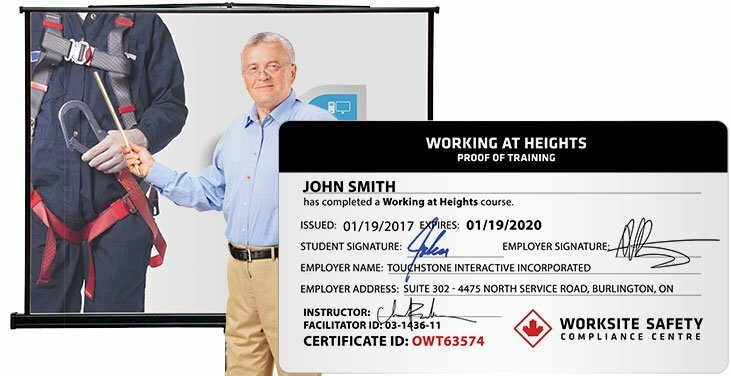 Worksite Safety has been approved by the Ontario Chief Prevention Officer as meeting the working at heights training program and provider standards. This Working at Heights course offers practical knowledge required for safely working at heights. Students will participate in hands-on equipment and setup exercises, and address safe practices and procedures as specified in Regulations by the Occupational Health and Safety Act of Ontario. Select your preferred training date and then add however many seats you require to your cart by selecting “Book Now”. You will then be asked to fill out your billing and attendee information before completing your booking and payment. Once processed. You will automatically receive a receipt and confirmation for your booking reservation. A second email with the details for your training including: start time, directions, and anything you will need for your upcoming class will follow shortly after. Parking is free, and available for attendees in the Training Centre parking lot. CPO Approved	Ontario Ministry of Labour Provider ID: PRO-34957. Working at Heights Program ID: WAH - 34957. Certificate Issued	Upon completion of this 8 Hour training course, students will be issued a certificate showing proof of training, approved by the Ontario Ministry of Labour. Materials Provided	Course materials, workbooks, and a writing utensil will be provided. Breaks & Lunch	There are a couple 10-min breaks, as well as a 30-min lunch. Coffee will be provided in the morning. Please plan for your own lunch. No Charge Cancellation	If for any reason you cannot attend your training class that you have booked, you can contact us at least 3 business days prior to your class for a full refund or 1 business day to reschedule. Group Discounts	Discounted training rates and flexible scheduling options for groups are available. Please contact us for details. On-Site Training	For groups of Eight or More, the Working at Heights course is available at your location, on a date of your choice. Please contact us for a quote.